Phyllo is the dough used in a variety of Greek sweet pastries and savory dishes, such as baklava and spanakopita. The tissue-thin layers make for flaky results, but can also be challenging to work with. By being patient and following some simple steps, however, you can learn to easily handle this delicate dough. Although phyllo dough is readily available frozen in most markets, freshly made phyllo dough (also spelled "filo") is always preferable, and it isn't difficult to make. 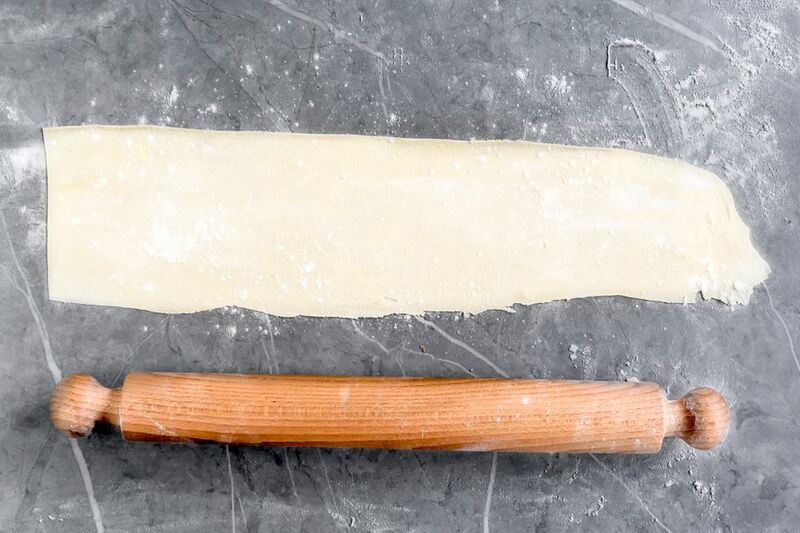 Once the dough is complete, you will need to turn the dough into thin sheets—you can either use a pasta machine or roll it out with a rolling pin; the latter takes time and experience to master (see below for special instructions). Also, take note that the technique for making the dough differs depending on which method you use to roll out the dough. This recipe calls for raki, an unsweetened anise-flavored liquor, but you can substitute white vinegar if you choose. Also, the key to a successful dough is to use the hottest tap water possible. The dough is ideal for small fried and baked pies, as well as pan-sized pie crusts. On a floured surface, knead by hand for 15 to 20 minutes until soft and malleable, with a smooth feel. Wrap in plastic wrap and refrigerate overnight before using. Divide the dough into 18 to 20 equal pieces. To make phyllo sheets, run the pieces of dough through the pasta machine. Start with setting 1 (the thickest), and run the dough through several times, increasing the setting number each time you put through. For pastries, finish at setting 9; if you are making small fried pitas (pies), use setting number 6. Unused phyllo can be kept in the refrigerator, in air-tight wrapping, for up to 10 days after making. Add 6 cups of flour to a large bowl (the remaining 2 cups will be used when rolling out the dough). Make a well in the center and add water (start with 1 cup) and raki or vinegar. Combine with a fork. Add the olive oil and lemon juice and continue mixing, adding more water if needed to make a soft dough. Turn the dough out onto a floured surface and knead by hand, oiling hands if needed, until the dough is soft, malleable and smooth about 10 minutes. Divide the dough into 18 to 20 equal pieces and roll each piece out to a roughly oval shape, about 18 to 19 inches across, sprinkling the work surface and phyllo with flour to keep from sticking. Use the rolling pin to gently roll out the dough to paper-thin thickness. When using the rolling pin method, the sheets will be about the thickness of two sheets of copy paper. Over time, as you become familiar with the texture and rolling process, you should be able to make the dough even thinner; however rolling out to the thickness of commercial phyllo dough—which is done with a machine—may never be achieved. It should be noted that even the thickness of copy paper will produce a fine and flaky crust.